Make 3D eBook flip and rotate in a 3D space? Q:Make 3D eBook flip and rotate in a 3D space? In 3D PageFlip Professional, you can create wonderful flipping effect for 3D page turning eBook which is different from the traditional one. What it is? 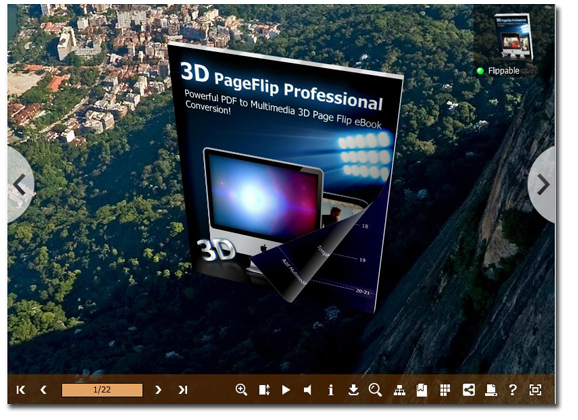 It is a simple way to flip your eBook in a 3D space! How fantastic it’s. Just use your mouse wheel to rotate or drag eBook to spin 360 degree. How will you feel when your eBook suddenly flip from the high sky to the foot of moutain? How could all these amazing 3D effect be created by you? Start from here! Step One: Install 3D PageFlip Professional and run the software. Click template button in the setting panel. 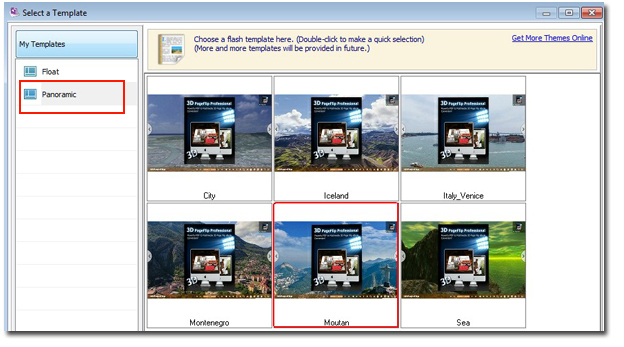 Step Two: Choose “Panoramic” and click OK. That means your 3D page flip book can be rotated in a panoramic 3D space. Step Three: Click “Apply change”. As you can find on the right top of the 3D eBook, there is a small window with a small 3D book in it. You can press your mouse on the small book and drag, and then you will find your realistic 3D page turning book spinning in a panoramic background! Pay attention to the hint in the small eBook window on the right top. If the caution light turn green, that means the eBook is flippable. When it’s red, the eBook will be not flippable.